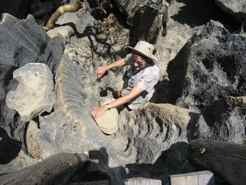 What Are The Tsingy of Madagascar? 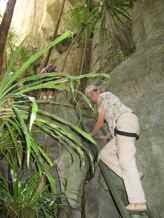 A Hike in the Tsingy of Madagascar? 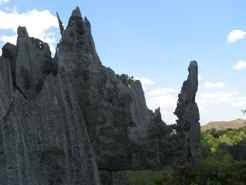 I didn't know about Tsingy when I started planning to travel to Madagascar. Is that a type of lemur? 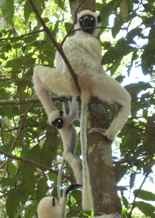 I mean there are lemurs called Sifakas and Indris and Aye-ayes. So exactly what are we talking about? 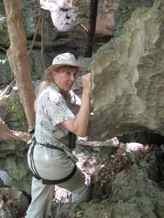 Our tour company described it as "fantastic limestone formations," and they suggested a hike in this geologic wonderland. 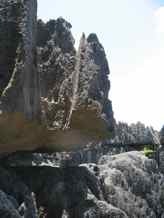 A friend told us that even though he travels to see primates, it was his hike in the Tsingy of Madagascar that amazed him. 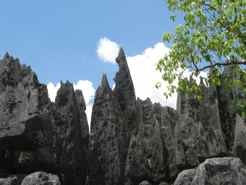 "Tsingy de Bemaraha Strict Nature Reserve comprises karstic landscapes and limestone uplands cut into impressive 'tsingy' peaks and a 'forest' of limestone needles, the spectacular canyon of the Manambolo river, rolling hills and high peaks. 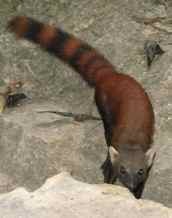 The undisturbed forests, lakes and mangrove swamps are the habitat for rare and endangered lemurs and birds." OK... limestone pinnacles with lemurs and birds. Sounds good. We decided it should be included in our itinerary, but even with all of this I still really didn't know what to expect. I don't think most tourist brochures will really prepare you for what to expect, so let me tell you what we encountered. There is no easy way to get to this National Park, but that shouldn't keep you away! The best way is to fly to the beach town of Morondava. Air Madagascar flies there, and there are decent hotels to stay in. 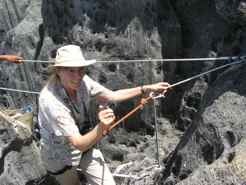 The Tsingy are about 150 km or 93 miles from Morondava. Not bad, you're thinking... but let me tell you, the road isn't good. Read this again... the road is not good. 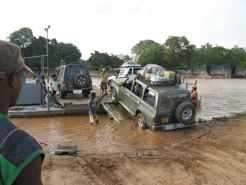 And you will have a couple of adventurous ferry crossings. It will take all day to go that 150 km, but more on roads on another page! You can break your drive at a river town called Beka. To our way of thinking, driving straight though in one day is better than spending the night in Beka. The hotels are better in Morondava. We would, however, recommend having the gambas (big river shrimp) for lunch in Beka. Next there is the heat. 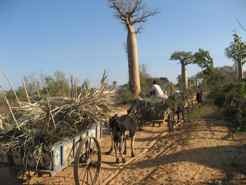 You can only visit the Bemaraha National Park in the dry time of year; the roads would be impassible during the rainy season. 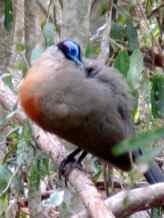 Dry season translates to HOT! They are promoting eco-tourism, and new accommodations are going up, but be advised you may not have air conditioning. There are ceiling fans and cold Three Horse Beer (the local beer).... so it could be worse. ...or "where one cannot walk barefoot" depending on who's translating. That last translation is more graphic! There are 165,000 acres of these pointed peaks.... so many soaring, jagged needles of rock that it looks like a forest of rocks... thus the World Heritage description of a forest of limestone needles. Some needles are 100m high. This vast area was once covered by ocean. You can see fossils in some of the rocks. Over the centuries, rain and wind have carved and etched the rocks into this surreal landscape. That's right... Start your hike as early in the morning as you can because of the heat. 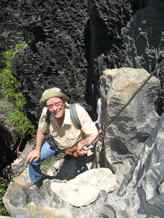 You or your guides must get hiking permits from the National Park Office which state an approximate starting time. Get these as soon as you can after you arrive, especially during the high tourist season. It took us an hour to get from our lodge to the parking lot where our hike in the Big Tsingy started. 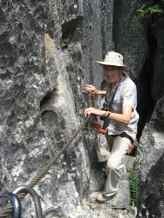 That was when our guide pulled out the climbing harnesses. This could be more than I was counting on I was thinking. As it turned out it was a strenuous hike and as close to rock climbing as we will ever come... but it was not really climbing, and it was all worth it. 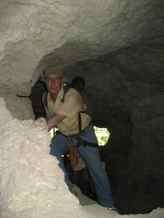 There are many areas where you will be climbing up through crevasses and though cave-like tunnels. There are several steep ladders. 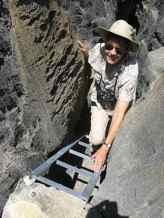 There are many areas where small rocks have been pounded into small crevasses to provide rock "ladders". There are narrow ledges and very steep ups and downs... and you will feel like you're climbing, but none of it is technical climbing. In many of these areas, the guides want you to hook onto cables for safety.... that's what the climbing harnesses are for. Know What To Expect and Go For It! Three of us went for it and loved it... once we were done. One of our group opted out when the guide pulled those climbing harnesses out. If you know what to expect, you can go for it and enjoy the whole experience. There is a hike closer to the river and the hotels called the Little Tsingy. It is a shorter hike, and from what we heard, it's easier but still gives you a good idea of what this whole geological wonderland is all about. The guide books say there are impressive limestone pinnacles in the northwest of the island, but I can't tell you about that. 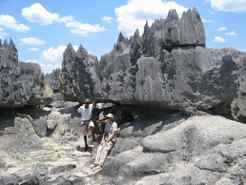 What we will tell you is that to round out an itinerary to Madagascar, a visit to the Tsingy is well worth the effort. En route to the Tsingy de Bemahara, you'll see a whole area of Madagascar that you would miss otherwise, spend a night or two in an interesting beach town, drive through Baobab Alley, have some incredible ferry crossings, a great lunch and hike through geologic areas that still defy adequate description as far as I'm concerned. So we say, go for it.... we just wanted you to know what to expect.